"Jim Mero, GM's development engineer, drove the ZR1 around the Nurburgring in 7:26.4. According to the GMNext blog, the run took place earlier this morning and that conditions were good on the track, with the exception of a strong headwind down the main straight. Mero mentioned that he felt there were a few places where he could have gone faster, although no details were provided about why and where. Juechter makes it clear that the ZR1 that lapped the 'Ring was instock trim, with the exception of safety and communications equipment. 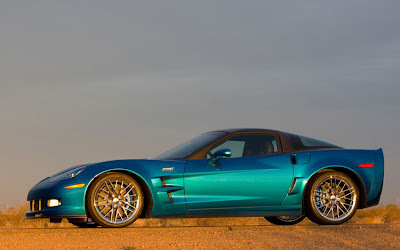 As such, the ZR1 was wearing the same Michelin Pilot Sport 2s found on the production model, the chassis alignment and vehicle height were set to factory specs and the unmodified engine was running on pump gas. The lap began with a rolling start – which falls in line with current industry practices – and the time was confirmed both through an electronic timing system and two hand-held stopwatches. The ZR1 team will be posting a video of their run when they return from Germany and we'll be keeping our eye out for it when it's online the week of July 7th." haha Thats just going to piss off Nissan. I can see it now; "Nissan laps the ring in 7:25.3! ZR1 crashes trying to keep up!" i thought the 7:29 posted by the GT-R was with a V-spec, not the base GT-R. the second run of the base GT-R posted 7:35 around the ring. Not surprising the ZR1 went that fast. When the CTS-V runs ZR1 times I'll be impressed. Theres the video of the stock normal GT-R running a 7:29. The SpecV is goign to be faster. I think though, Nissan had something in the bag with the 7:29 run. I think they were waiting for GM to put their lap time out. Especially with the release date of the car in the US of 7/7/08 here in just a couple weeks.